Women may face many different problems when trying to conceive and get pregnant, for some it happens naturally and for others there are obstacles that must be overcome. One problem that could prevent a woman from conceiving is having one fallopian tube that is blocked. To understand what blocked fallopian tubes are, a person first needs to understand what a fallopian tube is. The fallopian tubes are two thin tubes which are located on either side of the uterus and lead the egg down from the ovaries into the uterus. When a tube is obstructed, it keeps the egg from being able to travel and it can be blocked on one side or both. 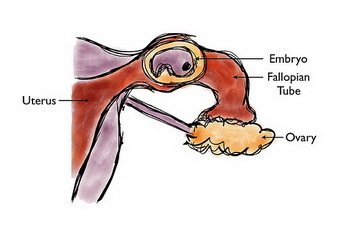 Tubal factor infertility is a problem experienced by approximately 40% of women and is not completely uncommon. The chances of getting pregnant with one fallopian tube blocked can accurately be determined after a woman has undergone a physical examination, had blood work performed and an ultrasound done. Each month when ovulation occurs and egg is released and if it cannot reach the fallopian tube, pregnancy is going to be almost impossible. If one or both fallopian tubes are blocked the egg cannot get where it needs to be and the sperm cannot reach it. It is also entirely possible for one fallopian tube to be partially blocked, but this increases the risk of a woman experiencing a tubal or ectopic pregnancy. Often if a blocked fallopian tube is present, a woman can undergo a laparoscopic procedure to see if it can be corrected, in some cases this will work. There is a specific type of blocked fallopian tube called a hyposalpinx, which happens when a blockage causes a tube to dilate and fill up with liquid. The fluid will block the tube, prohibit sperm from reaching the egg and prevent fertilization and pregnancy. The chances of getting pregnant with one fallopian tube blocked will depend upon many factors and if the woman chooses to get medical attention to help her conceive, it might be possible. It is important to have the condition monitored by a medical professional and to follow any advice provided in order to yield the desired outcome. Pain in left fallopian tube.